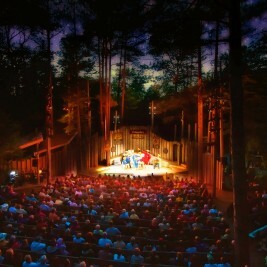 Presenting three shows in rotating repertory outdoors at Peninsula State Park Amphitheater, June 12 – August 24. Featuring the world premiere of “We Like It Where?” by Corrie Beula Kovacs and Stephen Kovacs, based on the true story of Winneconne’s 1967 hilarious publicity stunt to secede from Wisconsin. Fall season moves indoors to Northern Sky’s New Creative Center Theater August 30 – October 26 on County Road A in Fish Creek. Featuring the world premiere of “Dad’s Season Tickets” by Matt Zembrowski, a musical celebration of family, folly and the Green Bay Packers.